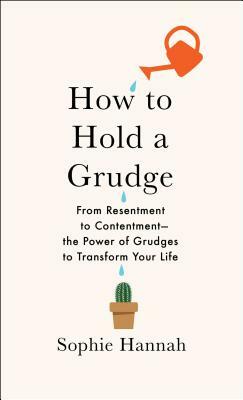 The first and only comprehensive examination of the universal but widely misunderstood practice of grudge-holding that will show you how to use grudges to be your happiest, most optimistic, and most forgiving self. Secretly, we all hold grudges, but most of us probably think we shouldn’t, and many of us deny that we do. To bear a grudge is too negative, right? Shouldn’t we just forgive and move on? Wrong, says self-appointed grudge guru Sophie Hannah, in her groundbreaking and irreverent self-help guide. Yes, it’s essential to think positively if we want to live happy lives, but even more crucial is how we get to the positive. Denying our negative emotions and experiences is likely to lead only to more pain, conflict, and stress. What if our grudges are good for us? What if we could embrace them, and use them to help ourselves and others, instead of feeling ashamed of our inability to banish negative emotions and memories from our lives? With contributions from expert psychotherapists as well as extracts from her own extensive catalog of grudges, Sophie Hannah investigates the psychological origins of grudges and also offers not-so-obvious insights into how we should acknowledge—and embrace—them in order to improve the quality of our interpersonal relationships and senses of self. Grudges do not have to fill us with hate or make us toxic, bitter, and miserable. If we approach the practice of grudge-holding in an enlightened way, it will do the opposite—we will become more forgiving. Sophie Hannah is an internationally bestselling writer of psychological crime fiction, published in forty-nine languages and fifty-one territories. Her thrillers are award-winning and have been adapted for television. Her poetry has been studied across the UK and has been shortlisted for the TS Eliot Award. How to Hold a Grudge is Sophie’s first nonfiction book.